He briefly comes on the lap and gives a furtive kiss, then searches the pen for clues, listens to noises, looks for exits that might lead his to his lost former life. Our HOPE is - One day someone is going to hug him so tight that all his broken pieces will stick together. His REALITY is - he doesn't have someday - he only has today. NOT RESERVED - WILL BE KILLED BECAUSE HE IS SCARED - at Big Spring Animal Shelter. 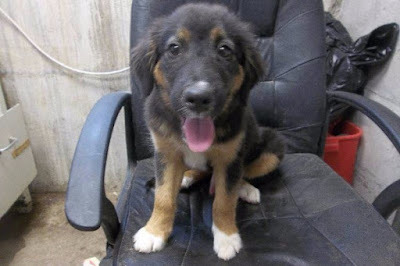 A volunteer writes: Shepherd pup is a pretty spring flower. he is beauty personified, passersby are all oohs and ahhs ... Shepherd pup, a very young boy, came in rather scared at the care center. We had to tippy-toe around her. he is slowly coming out of his shell acknowledging us as potential friends he can trust ... Indeed, Shepherd pup is very precious looking and seems to have been outstandingly cared for. he is perfectly made, healthy, the right weight and has the allure of a princess ... Shepherd pup has a way to go. I trust he can do it and be again a lively and happy young dog, maybe not with us as it stands, but with you, in your home and with your love, care and patience as your pet and forever best friend."